Bryan was able to get out for a five day photography trip from southwestern Missouri down through the eastern edge of Oklahoma. His film has arrived, the slides scanned and the highlights are loaded on the website. 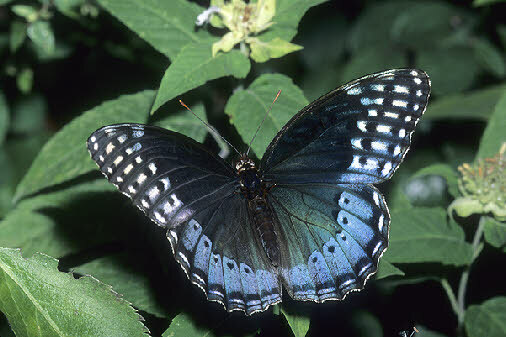 Southern Cloudywing, and two new species for Bryan, the Spicebush Swallowtail and the stunning Diana Fritillary. The latter species is interesting for its sexual dimorphism. 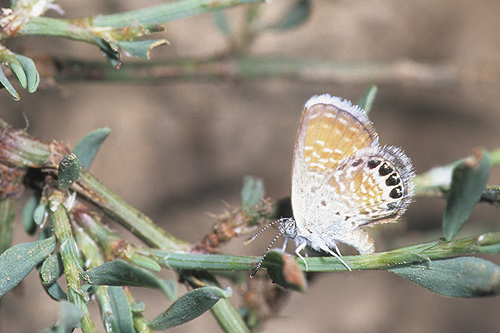 The females are a stunning blue while the males are orange. Bryan got a lucky shot of a female in flight. After Beech Creek, Bryan proceeded to the Little River National Wildlife Refuge near Broken Bow, Oklahoma. Out in large numbers were both Southern and Creole Pearly-Eyes which Bryan photographed extensively. Some were so cooperative he was able to get 2X photos of the eye-spots. 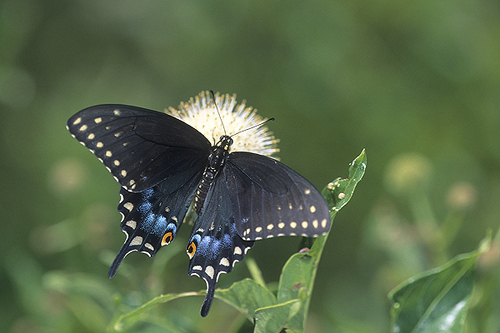 He was also able to photograph a very fresh Spicebush Swallowtail and a fresh Giant Swallowtail, both gathering minerals from the damp gravel road. - Ray is doing butterfly work in Iowa. We hope to post an update on the site soon. - The BOTWF plans on attending the Encylomedia Conference in October. - Work is still proceeding for finishing the species treatments. This has become a long process, but we want the site to be as inclusive as possible. - A slide show has been added to the site. Images in it will be changed on a regular basis, so check it often. 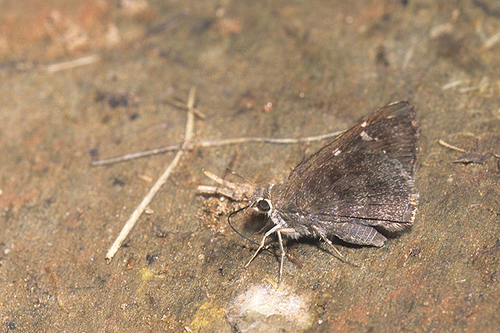 and an ovipositing Western Pygmy-Blue. 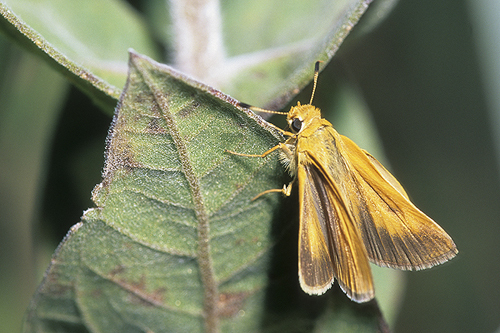 Bryan was able to add another species to his photographed list, the Outis Skipper. documented in his home state of Oklahoma, but after five years of searching, he never saw one until recently. - Bryan leaves for New Mexico from the 15th through the 20th of August. He’s looking forward to visiting some old butterfly spots he explored in the late 80’s and early 90’s while stationed there in the Air Force. Hopefully, he’ll add some good species to the list. - There are a couple butterfly counts coming up in September. The first is at the Pontotoc Ridge Preserve on the 25th and the second is at the Oxley Nature Center in Tulsa on the 30th. Hopefully, the extreme heat will have abated by then. - We’re still planning on being at the Encyclomedia Conference on the 7th and 8th of October. Stop by and say hi. - Also in October, the BOTWF will be in the Lower Rio Grande Valley from the 23rd through the 31st. There are a few butterfly presentations and walks scheduled. Check out our October calendar for details. We also hope to significantly expand the photo species list on this trip. the site is complete, it will be easier to maintain as new species are added. - Ray surveyed several sites through the summer in Iowa and one in northern Missouri. 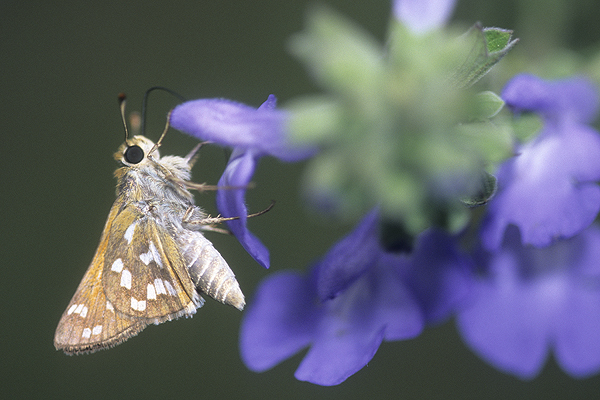 He had a couple sightings of the rare Two-Spotted Skipper, Euphyes bimacula. That’s all the news for now. Check back in a couple weeks for some images from New Mexico. group, please provide feedback and especially notify us if you see any errors. Echo Azure, Field Crescent and Small Wood-Nymph. They got more coverage of the Funereal Duskywing, Weidemeyer’s Admiral, Common Checkered-Skipper, Arizona Sister, Bordered Patch, Painted Lady, Reakirt’s Blue, Marine Blue, and Dun Skipper. They had a great time in the mountains and really enjoyed eating some fine New Mexico green chili. Oklahoma Bioblitz 2010 near Ponca City, Oklahoma on 9 October from 1300-1400. We hope to see you there! patiently waiting for dates, locals, etc., now have that information. The next task is to finish the actual species treatments. Hopefully, this will be done soon. That’s all the news for now. It’s been a month since the last update and a lot has happened since then. Bryan gave two talks which were very well received. The first was at the public library in Blanchard, Oklahoma on 24 September, and the second was at the Oklahoma Bio Blitz at Kaw Lake and Camp McFadden near Ponca City, Oklahoma on 9 October. There were passionate ‘butterfliers’ at both. At the Bio Blitz talk a troop of Girl Scouts were present with tons of great questions and observations. The Blanchard talk was held in conjunction with the annual Monarch Migration Festival which was held two miles east of Cole, Oklahoma on 2 October. Bryan attended and it was really nice to see the youngsters with butterfly face paintings and butterfly wings attached to their backs. Bryan was finally able to meet Marilyn Stewart who owns Wild Things Nursery. She specializes in native plants and has many butterfly larval food plants as well as native nectar sources. She comes highly recommended and her website is here. Ray gave three presentations to the Richmond Elementary School in Stillwater, Oklahoma which were highly enjoyed by all. strays which were not photographed in North America, but are occasionally found there. 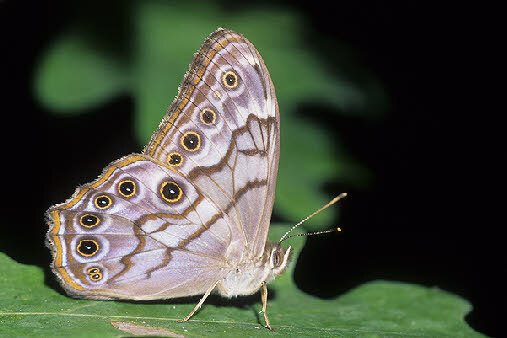 These include the Tiger Mimic-Queen, Tropical Buckeye, Tanna Longtail, and Glassy-Winged Skipper. Bryan was able to get out a few times to the Lexington Wildlife Management Area and other areas for some photography. 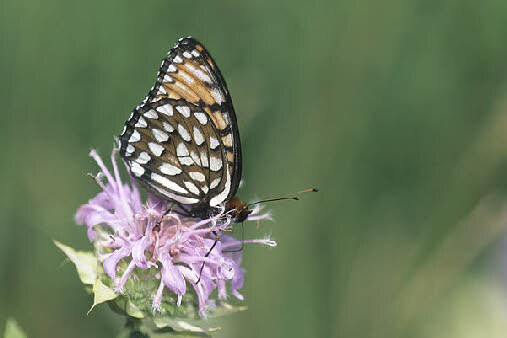 New images were obtained of the Gulf Fritillary, Pearl Crescent (one getting captured by a Black and Yellow Argiope), Common Buckeye, Delaware Skipper, Tawny-Edged Skipper and some shots of an ovipositing Variegated Fritillary and her egg on Passionflower. Bryan and Laura are looking forward to their trip to the Lower Rio Grande Valley the last week in October. Four presentations and one butterfly walk have been scheduled. Please check the October calendar for more details. Hopefully, the next news update will include several new species from that area. And finally, the species treatments are still plugging along. We anticipate, once colder weather sets in, this will be done in short order. It’s been another busy month for The Butterflies of the World Foundation. Numerous emails have been received asking about the trip Bryan and Laura took to the Lower Rio Grande Valley during the last week of October. Four presentations and two butterfly walks were given to eager crowds at three different locations in the Valley. They met many people with a passion for butterflies and made many friends. They have been invited back for next year and hope to make this an annual event every October. In other news, on 4 November, Bryan gave a presentation to the Cleveland County Audubon Society at the Sam Noble Museum of Natural History in Norman, Oklahoma, which was well received. 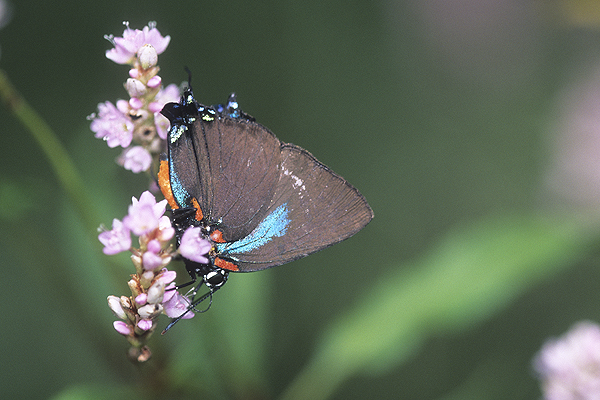 Also, plans are now in the works to send Bryan to Coppermine, Northwest Territories, to photograph high Arctic butterflies in July 2011 with Professor Ronald Royer. And finally, more progress has been made adding species accounts to this site. As the weather turns colder, more time will be dedicated to completing this project. 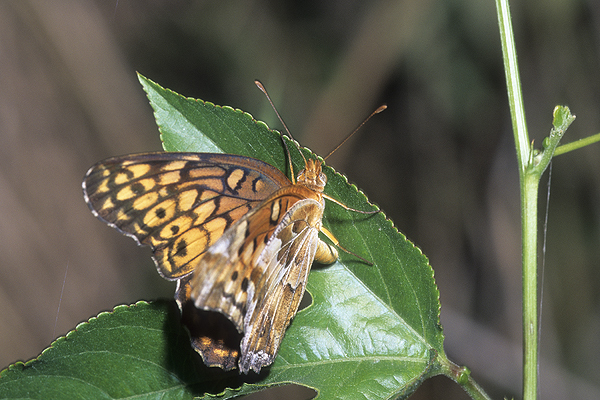 Also, the slide show has been updated with recent Texas butterflies. We hope you enjoy the new Lower Rio Grande Valley additions. Please let us know what you think or if you notice any errors. Have a happy Holidays.